Below is one of the many charts included in this week’s Sector Snapshot, which shows the percentage of stocks in S&P 500 sectors trading above their 50-day moving averages. 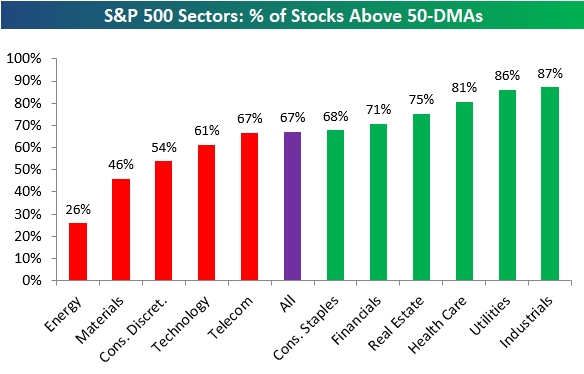 As shown, 67% of stocks in the broad S&P 500 are above their 50-DMAs, while six of eleven sectors have readings stronger than 67%. Technology and Consumer Discretionary — the two best performing sectors YTD — have weakened a bit and now have lower breadth readings relative to the S&P.